Hayley is originally from the small town of Mukwonago, WI. 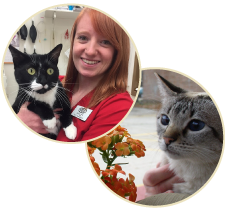 She joined the Whole Pet team in August 2018 as a full-time veterinary technician assistant. She recently graduated from the University of Wisconsin - Madison in May of 2018 with a degree in Animal Sciences. While applying to veterinary school, she is working to save up money and to gain as much experience as possible. She has a love and passion for all animals, but is most interested in mixed animal veterinary medicine. Hayley has also worked as a veterinary assistant at the UW Large Animal Hospital for a short time, and is currently a volunteer at a small horse stable doing stable chores two times a week. Her goal one day is to own a few horses of her own (maybe a cow or two), as well as MANY cats and dogs. In her free time, she enjoys watching Netflix and hanging out with her handsome cat, Stanley, as well as spending time with her boyfriend.